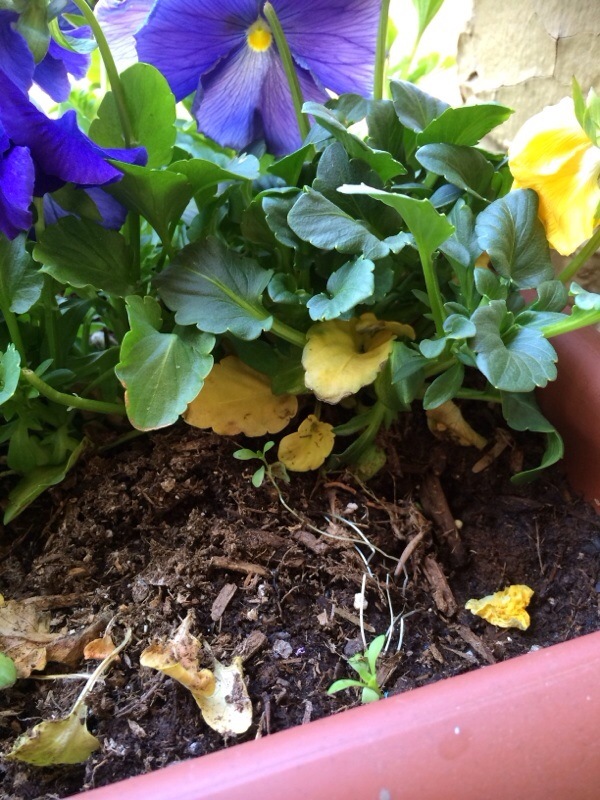 The description of mushy leaves and the yellowing leaves may be the result of a root/crown rot, a fungal disease common to pansies caused by a Phytothera or Fusarium fungi. It is soil borne and infects the roots at the base of the plant. If the plant flops over when pushed lightly, this may be the problem. 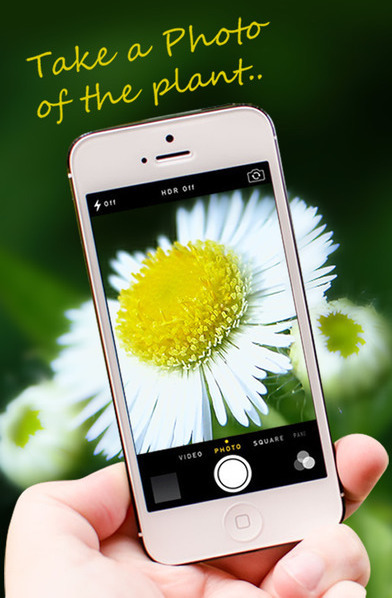 Plants may wilt and suddenly die or the leaves may simply turn yellow. A dark sunken area may be seen on the stem at or near the soil line. Roots may appear rotted. Some plants may survive but remain weak and stunted. If these are the symptoms, suggest you dispose of the plant and the soil in the trash, sterilize the container with one part bleach to 10 parts water and start over. Show your photo to a local garden center for confirmation of the problem. The seeds that you see here are pansy seeds. They are more noticeable than usual here because of the rot on the plants. The seeds are normally made by pansies all the time, however, and aren't related to the fungal condition here. 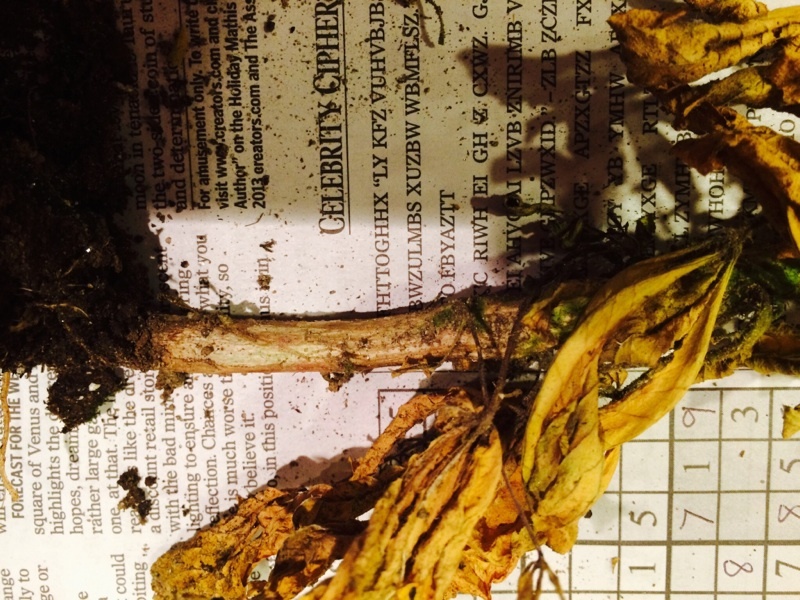 The death of this plant could have been caused by overwatering, or a combination of too wet and cold. If the plant happened to have been hit with something such as hot water (usually from sun-heated hose), cleaning products, or other garden chemicals that initially killed it, the rot might be secondary and just forming on that dead tissue. This plant kind of looks like it died first and then rotted. In general, water plants deeply less often and don't water late in the day or evening so that the plant stays wet overnight. Let the foliage dry out in between waterings. Right now clear this plant from the garden and toss it out. Hopefully you have other pansies and signs of spring or early summer growth! Stems that look chewed like this are usually stripped by slugs, snails or earwigs. Once they girdle a stem there is no saving the plant. 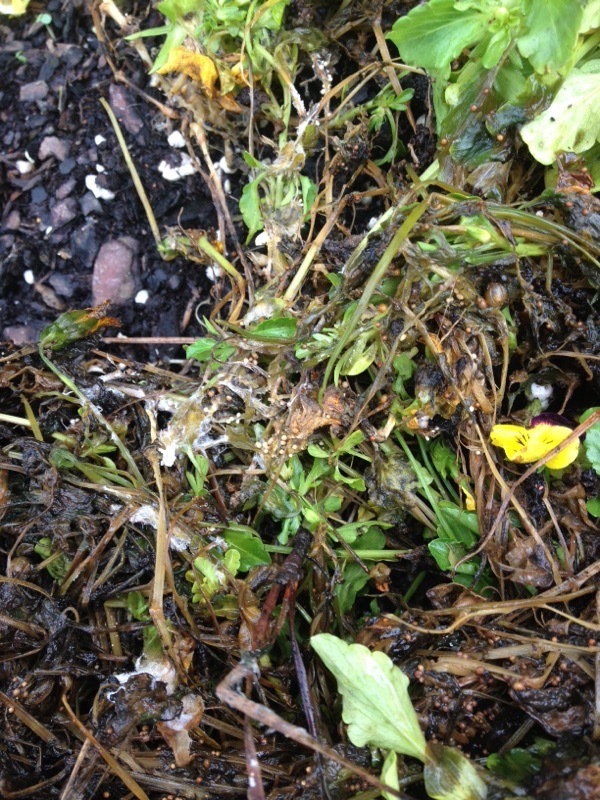 Usually this sort of damage appears shortly after you plant annuals, since the new plants are tender from the grower. Once they've been in place for awhile the plants toughen up and the pests no longer find them attractive. To prevent this from happening in the future, right after you put the plants in the ground dust them with diatomaceous earth, getting the powder on the stem, leaves and surface of the soil. (There is a good video on Youtube about how to make a DE applicator out of an old plastic water bottle.) Usually you only have to dust the plant right after you put it in, although you'll need to water the plants well first and let them dry before applying the diatomaceous earth. (watering and rain make the DE less effective.) This is a good idea when planting Cleome, marigolds and dahlias as these pests seem especially fond of those annuals. 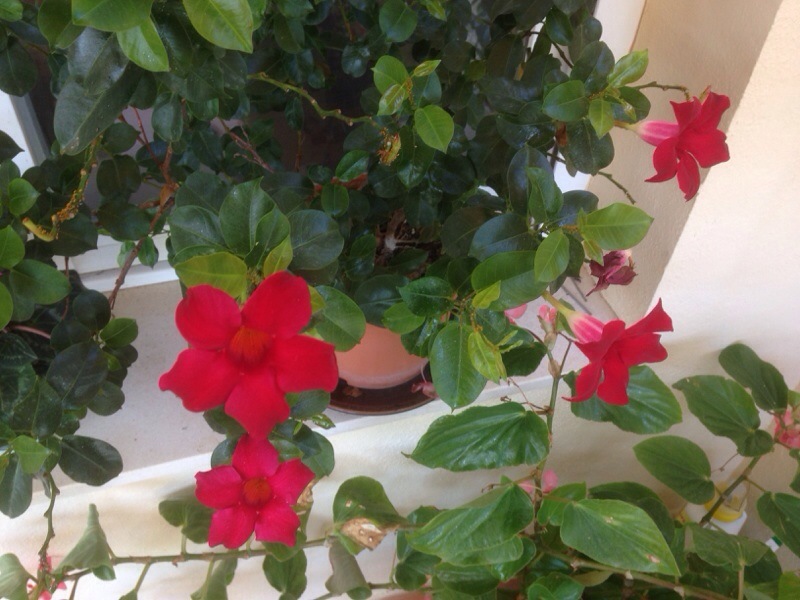 This is a tropical vine that can be used as an annual in your area. It grows best in full sun and will produce lots of flowers all summer long. 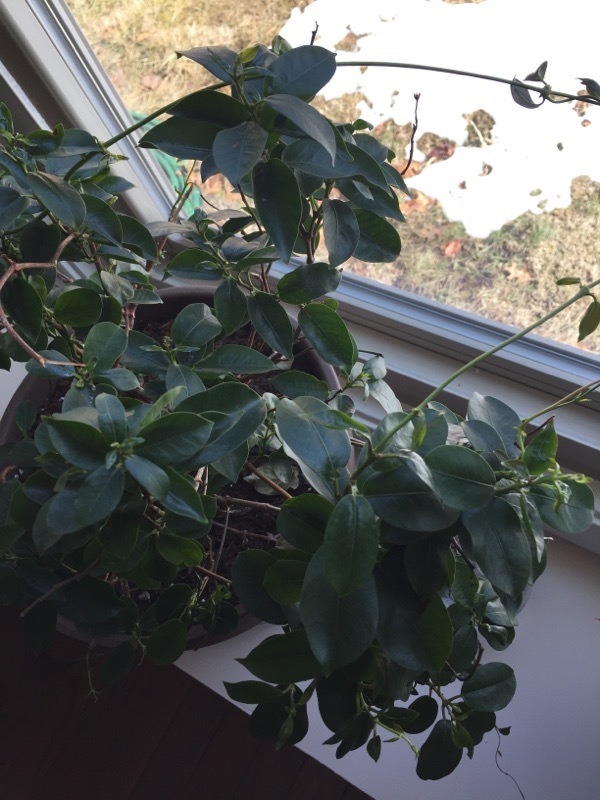 It will die when temperatures go below freezing, but you could bring it indoors and keep it as a houseplant, although it probably won't flower either indoors or until late in the summer next season. These plants need specific hours of daylight in order to come into bloom - they are given this at commercial growers but home owners don't tend to supply the artificial lit "long days" turning into shorter days that bring the plant info flower. So many people who overwinter this are disappointed that although the plant lives and grows well once it's outside again, they don't start to flower until sometime in August. If you want one that's going to bloom all summer, leave it outdoors as long as the weather remains frost-free or treat as an annual and purchase a new plant after danger of frost has passed. Widely sold as potted flowering plants, this makes a great patio plant when weather is mild. This plant comes in many colors including orange, red, yellow and pink. Avoid hot direct sunlight, and go for more filtered or shaded light outdoors. Indoors place in bright, indirect light. Should be in well-draining potting soil in a container with drainage holes. Likes regular moisture, but not soggy conditions. When watering, take out of the decorative cover pot if there is one, water in the sink and allow to drain out before setting it back in the cover pot. Do not allow plant to sit in water as this may lead to root rot and feed with a slow-release or organic fertilizer formulated for blooming container plants. They will die back in the winter and although treated as an annual in many places they can be brought back in milder climates. They can be restarted by cutting them back to within 3" of the crown, reducing water and keeping them in a cool location. Increase water in spring. New shoots may be used as cuttings as well. 1. Plant in full sun - zinnias need at least 6 hours of dead-on sunshine including the noon hour. 2. Like all annuals they bloom on new growth so stimulate that new growth with fertilizer, either an organic product with a slightly higher first number (nitrogen) or a synthetic fertilizer that also has a slightly higher percentage of nitrogen. 3. 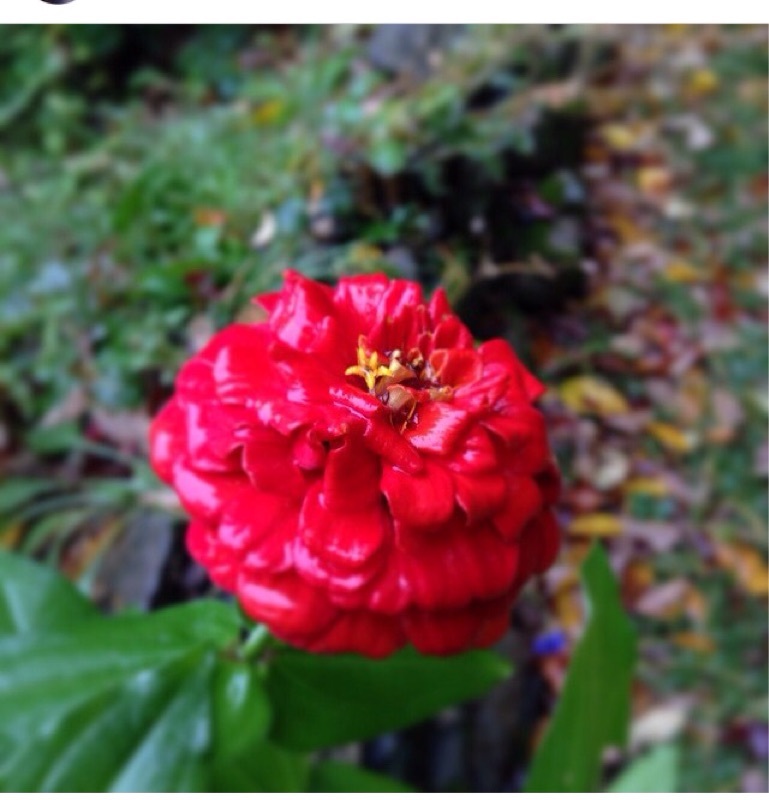 Water zinnias deeply once a week in most northeast gardens. These are plants from Mexico, so they do not like frequent splashing of water on their leaves. Frequent irrigation is the kiss of death for these plants! 4. Deadhead - that is, clip off the old flowers - consistently to promote new bloom. So cutting the flowers for bouquets does double duty: you get pretty flowers for the house or to give away, and you also stimulate more bloom! 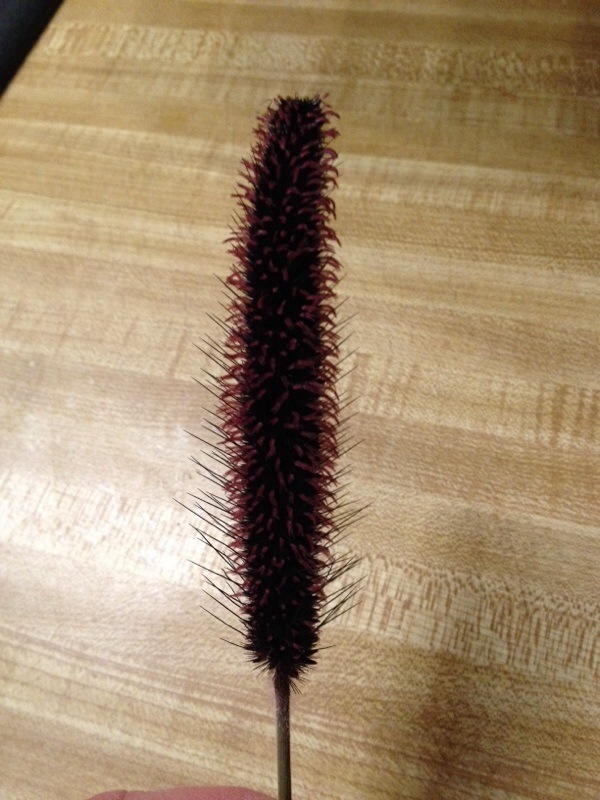 Purple Millet (Pennisetum glaucum) - A wonderful addition to the landscape and containers can be grown from Purple Millet seeds. This award-winning new Ornamental Millet grass offers spring leaves of bright chartreuse that mature through all shades of red and bronze into a burgundy-purple. Pennisetum glaucum Purple has been called Pearl Millet or Black Leaf Millet, and it is a dense, bushy ornamental grass that is topped with long, dramatic purple seed-heads. Pennisetum glaucum Pearl Millet is stocky and symmetrical, providing a dramatic edging to borders and beds. This ornamental grass is low-maintenance and gives a long display right up until frost. Purple Millet does best in warm climates, and in areas with cool summer temperatures, the plant may not reach full height.This is an annual ornamental millet. Very cool plumes, right? There are numerous types available with different colors of foliage and plumes. People usually buy these toward the end of the summer to use as fall annuals. Needs full sun and moderate water once established. This does not look like a pest or disease but more a "failure to thrive" situation. There might be several things going on here. First of all, the level of the soil is very low. How deep is the soil in this box? It looks like it might only be four inches or so, and this isn't enough to support good plant growth. Be sure to fill all containers to within an inch of the top, and don't put anything else in the bottom: no rocks, shards, or other "filler" no matter what your mother or neighbor told you. Secondly, are there drainage holes in this box? Every container should have holes for the excess water can drain out. Cosmos, which you have planted here, need good drainage. Thirdly, was any time-release or liquid fertilizer used? Annuals need "fast food" so either a time-release product or synthetic liquid are important. Ask your local independent garden center for recommendations. Finally, are these boxes in full sun? Cosmos need at least 5 hours of dead-on sun to flower well. 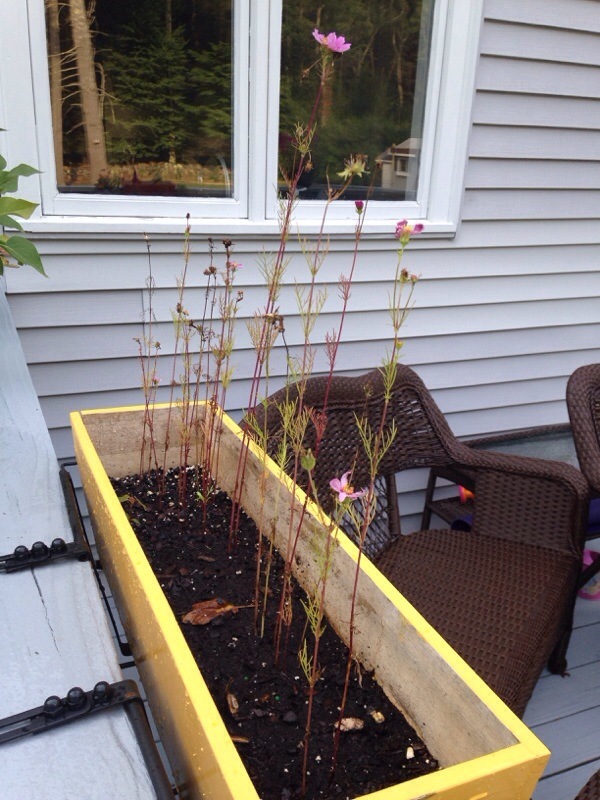 If these boxes get less, use New Guinea Impatiens or begonias instead. This is a tropical vine that can be used as an annual, but in your area will be a perennial where winters are mild. It grows best in full sun and will produce lots of flowers all summer long. It will die when temperatures go below freezing, but you could bring it indoors and keep it as a houseplant, although it probably won't flower either indoors or until late in the summer next season. These plants need specific hours of daylight in order to come into bloom - they are given this at commercial growers but home owners don't tend to supply the artificial lit "long days" turning into shorter days that bring the plant info flower. So many people who overwinter this are disappointed that although the plant lives and grows well once it's outside again, they don't start to flower until sometime in August. If you want one that's going to bloom all summer, leave it outdoors as long as the weather remains frost-free or treat as an annual and purchase a new plant after danger of frost has passed. This is a Plectranthus. These are wonderful annuals in the northeast and they can be kept indoors in the winter as houseplants. If you're able to put this plant out in the summer, do so as it will not only grow and prosper, but it's likely to flower later in the season. In fact, many plectranthus varieties such as yours have beautiful spires of lavender flowers later in the summer since they are triggered into blooming by decreasing hours of daylight. Pinch the ends off your plant to promote bushy, fuller growth. Instead of pinching you can also cut pieces that are 4 to 5 inches long off your stems, dip them in root-stimulating powder and place in moist seed-starting mix, both available from your garden center. In this way you can not only make your plant fuller and bushy, but you can also create new plants! 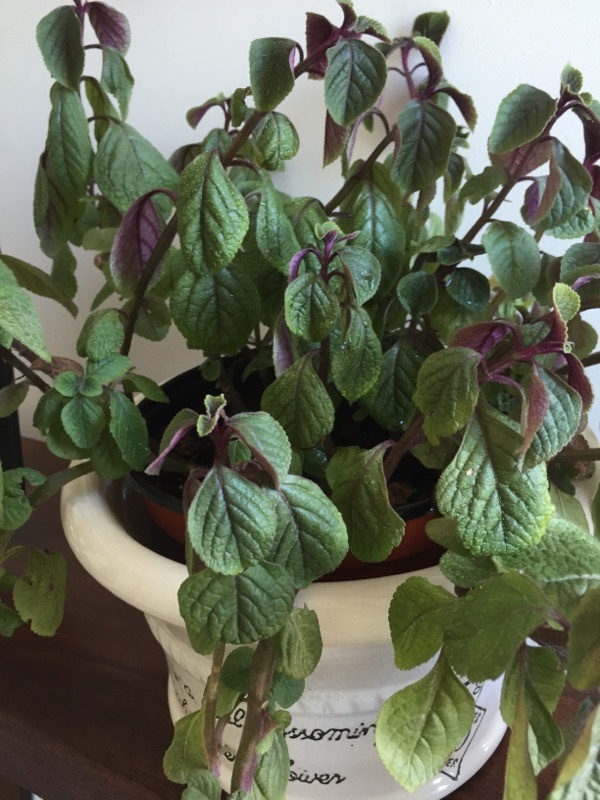 Grow Plectranthus in bright to sunny windows indoors and in full to part sun outdoors in the summer. 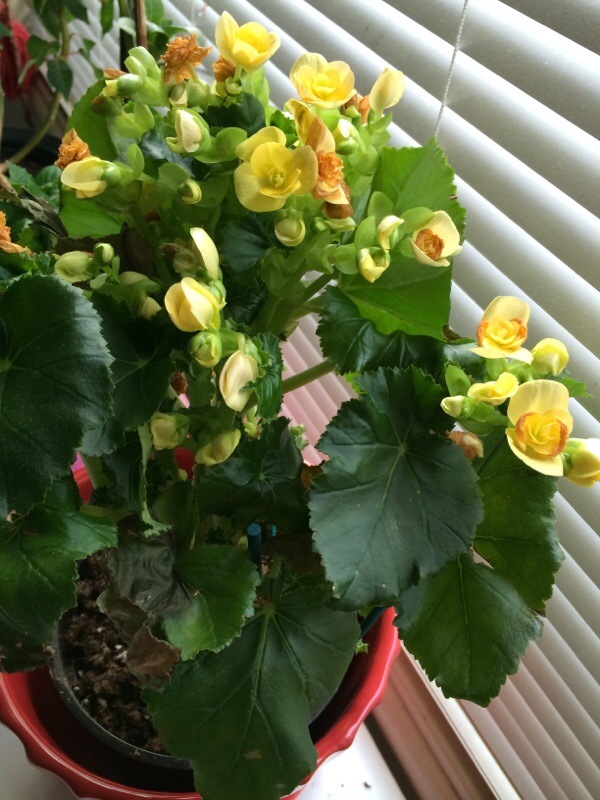 When moving a plant such as this from inside to outdoors in May, move it into part-shade first and then gradually into more sun so that it won't get burned. Plectranthus are beautiful plants that are fun to grow. Enjoy!